Legendary characters clash on ancient battlefields. Total War: Three Kingdoms is bringing the series' grand strategy formula to ancient China. It's the first large-scale historical Total War game since Attila, and while it's still about massive real-time battles and turn-based empire building, there is a strong focus on the legendary heroes competing to form the next great dynasty. Heroes have distinct personalities and loyalties. They can be great fighters on the battlefield, or masterful city governors. They can kill for you, spy for you, or even betray you and throw your faction into civil war. There's more to say about how the game plays on the battlefield, but today I'll focus on characters, because they represent the biggest change for the series. Everything described here is represented in 'romance' mode, which incorporates the mythical elements of the Romance of the Three Kingdoms. Three Kingdoms also features a more realistic mode that changes in-game events and dilemmas, and changes how the heroes are depicted in the battlefield to create a more sober historical take on the period. We haven't seen that yet, so some of these features may work a little differently depending on the type of campaign you play. Instead of picking a faction, as you would in a traditional Total War game, you pick a hero from a choice of 11, and take their role in the campaign. That means you have to be careful to ensure you have a trusted heir in place (in Three Kingdoms, there are lots of reasons to mistrust heirs, but I'll get to that later). Three faction leaders have been revealed so far: Cao Cao, Liu Bei, and Sun Jian. At the start of the campaign, a bunch of fragile alliances oppose Dong Zhuo. It sounds like he's going to serve as an opening miniboss, an appetiser that brings heroes into conflict. Your ultimate goal, once you've subdued Dong Zhuo, is to unify China under your banner. You build armies out of hero retinues in Total War: Three Kingdoms. An army can have up to three heroes, and each hero comes with up to six unit slots. In 'Romance' mode you control heroes independently and they can take on whole units in combat. In the more realistic alternative mode heroes have an honour guard so they look less like all-powerful superheroes. In battle you can control units independently and group them however you wish—just like a normal Total War game. However, units in a hero’s retinue will inherit any formations the hero knows. Some types of hero are better at passing on abilities to their retinue and buffing any units standing nearby, other heroes are better at fighting. Strategists: Creative Assembly's Development communications manager Al Bickham describes them as squishy characters with "big brains and small hands, but they're good at pointing." They excel at bringing new formations to battle. A unit of spearmen innately know how to form a spear wall, but if they're attached to a strategist they might also know how to form a hollow square or a hollow circle to defend from all angles. You move your strategists into the middle of one of these formations to protect them in battle. Strategists can also debuff enemy heroes. Vanguard: Powerful, rash warriors who disrupt the front line with big attacks. The vanguard hero I played with in the demo battle had a wide sweep attack that could send enemies flying, and a 'heartseeker' bow attack that softened up enemy heroes for duels. Commander: Described as classic Total War generals. They can fight, but they excel at buffing units around them with area-of-effect boosts. In the battle I played my commander could deploy a shout that braced nearby units for enemy charges. Ordering a bunch of spearmen to form a wall and then yelling at them to hold feels awesome. Sentinels: Brutish and tough. They take ages to kill, even in duels. Champions: Battlefield assassins that are born to duel. Point them at a hero you want dead and enjoy the show. If a hero is close enough to an enemy hero you can click a small 'duel' button above their portrait on the UI, and then select the enemy hero they want to duel. If the enemy accepts, fighters form a respectful ring around the combatants as they go at it. This looks great, thanks to some acrobatic mo-cap on the heroes themselves, but it also serves some tactical purposes. You can send a sentinel to lock down a vanguard hero, stopping them from tearing up your infantry. A hero might last longer in a duel than they would soaking up heartseeker arrows and heavy cavalry charges in open battle. In the battle I played I was able to refuse duels repeatedly, seemingly without penalty, and I wonder how this will quell the effectiveness of hero-killing champions and other combat characters. You can pull out of duels if it looks like you're losing. This is a very sensible move, because heroes have massive effect on the campaign map as well as in battle. Heroes have their own needs and allegiances that can shift across the course of a campaign. They form friendships and rivalries with other characters, and their satisfaction levels will change based on your actions. You can use this to your advantage by letting loyal characters leave your faction, under orders that they should spy on whoever else picks them up. The longer a spy stays in the opposing faction, the more trusted they become, and the more they can do to disrupt enemy activity. Heroes have 'cover points' that they can spend to take these actions. If the spy rises to the point where they become the heir to the enemy faction, you can trigger a civil war in their territory. Alternatively, if you can't wait, you can instruct your spy hero to break cover and raise an army in enemy territory. Computer controlled factions will float spies for you to recruit, so a degree of "healthy paranoia" is recommended, according to Bickham. You can construct counter-espionage buildings that increase the cover cost of spies operating in that province, and you can send heroes to do some direct counter-espionage. You can banish or execute suspects, but this could affect the satisfaction levels of any heroes in your faction that were friends with them. The ultimate counter-move is to make the spy in your ranks so satisfied with your faction that you can use them as a double agent and send them back to their home faction as a spy for you. You can improve heroes' satisfaction by behaving in ways they approve of (some hate it when you execute your enemies, for example), or you can give them gifts and powerful positions. It sounds like a smart way to roll some old agent roles into heroes, and it will create opportunities for sneaky counter-play in multiplayer campaigns. 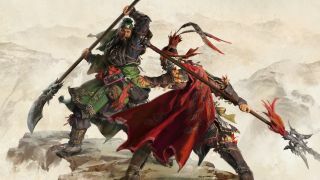 For more on the game, check out the gorgeous new campaign map, and catch up with everything else we know about Total War: Three Kingdoms.